Are you Ready to Spring into Summer? Join us for an evening of wine, snacks, information, a SculpSure® demonstration, and fun! Lighten, tighten, and brighten just in time for summer! Join us for an evening of wine, snacks, information, SculpSure® demonstration, and fun! 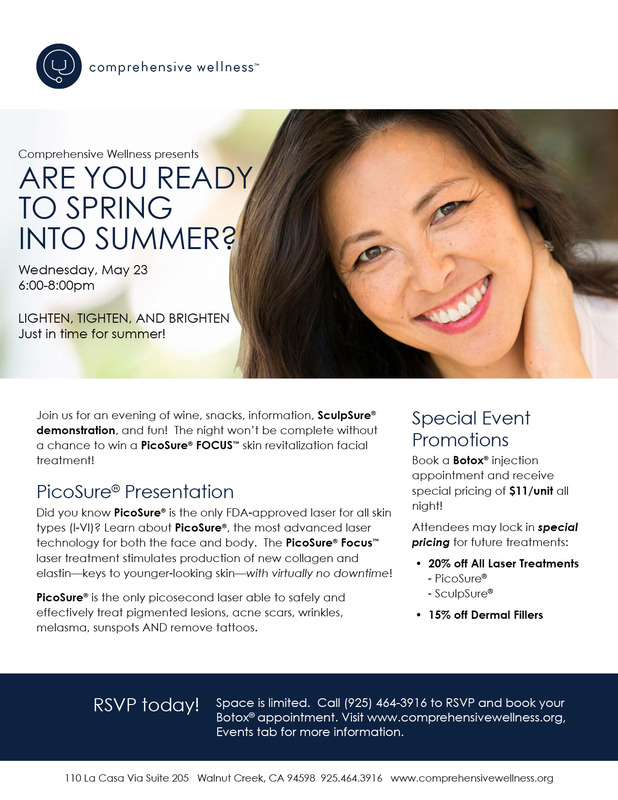 The night won’t be complete without a chance to win a PicoSure® FOCUS™ skin revitalization facial treatment! Space is limited. Call (925) 464-3916 to RSVP and book your Botox® appointment. Join us for Mindfulness Mondays! Comprehensive Wellness is pleased to be offering a four-class series of mindful meditation with board-certified hypnotherapist, Rebecca Berke. Rebecca Berke is a Hypnotherapist and Mindfulness Specialist who has spent decades working with the mind/body connection. Registration includes mindful meditation recordings and all class materiasl.